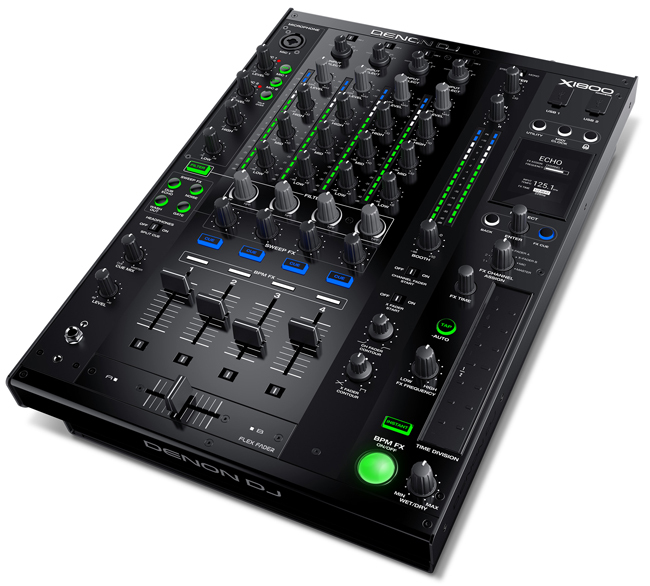 The very centrepiece of the Denon DJ 'Prime Series' of products, the X1800 is a 4-Channel Pro DJ club mixer, familiar in layout but with new and exciting features to transport you to your next level of live performance. The X1800 Prime brings dedicated Sweep and BPM FX controls, delivering multi-themed effects for each channel, giving you even more performance options to craft that unique sound. Why not add another dimension to how you utilize EQ in the DJ booth? Fire up the X1800's choice of Classic or Isolation styles, then ramp up the sonic creativity with frequency-controlled, band-Isolation too. The X1800 Prime's crisp, OLED screen is your window into even more creative expression within your DJ sets. 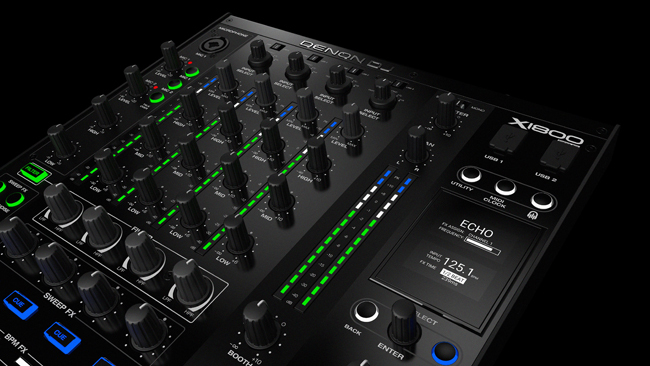 Personalize your workflow, access 12 additional, high-quality Denon DJ effects, then fire in the unique, quick-to-set Effects Quantization Touch Strip, engaging elegant rhythm-based adjustments to shape your sound to the max! The X1800 sports Denon DJ's 'Flex-Fader' Crossfader too, adjustable to how you like to rock the mix, with this and all other components, housed in the unit's rugged metal construction. Your audio source options are easily routed with the X1800 Prime's (4) Phone/Line switchable channels, plus an external signal, send and return option too. Add into the mix the (4) digital inputs at the rear, DVS capability, plus easy switching to USB inputs, and your avenues of sound are wide open. You can personalize your live performance elements with the two independent mic inputs, while monitoring the cue/split/master mix with either 1/4" or 1/8" headphone connectivity. 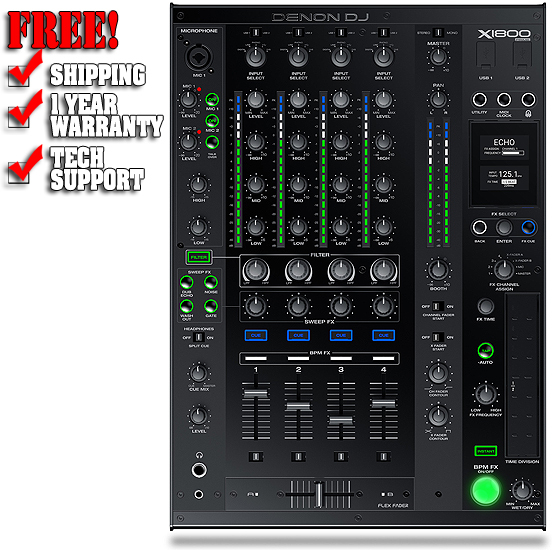 Of course, the X1800 delivers that legendary Denon DJ 24bit/96kHz sound quality-a must for demanding professionals. 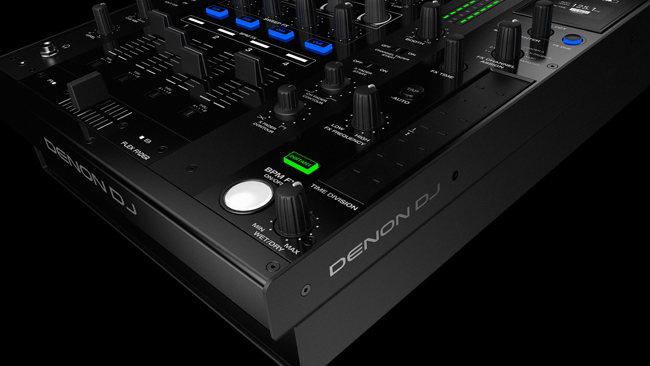 LAN network connects Denon DJ's SC5000 media players using the 'Engine Connect' protocol to align your tempo-based FX with even more accuracy and on-the-fly performance expression. The X1800 also has two USB audio interfaces bringing your choice of laptop based DJ software into the mix, plus handling quick and easy DJ changeovers in busy, live gig situations. Want even more connectivity? The X1800 also features a MIDI out port for your drum machines, instruments and effects boxes as well. With the Denon DJ X1800 Prime, the sky isn't the limit-you're way beyond!